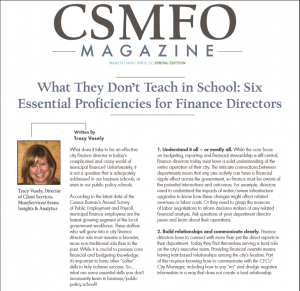 Avenu’s Tracy Vesely describes in CSMFO Magazine what it takes to be effective as a municipal finance director. 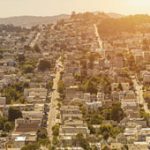 What does it take to be an effective city finance director in today’s complicated and crazy world of municipal finance? Unfortunately, it is not a question that is adequately addressed in our business schools, or even in our public policy schools. According to the latest data of the Census Bureau’s Annual Survey of Public Employment and Payroll, municipal finance employees are the fastest growing segment of the local government workforce. These staffers who will grow into a city finance director role must assume a broader, more non-traditional role than in the past. While it is crucial to possess core financial and budgeting knowledge, it’s important to have other “softer” skills to truly achieve success. 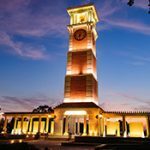 So…what are some essential skills you don’t necessarily learn in business/public policy school? Click here for the full story in CSMFO.